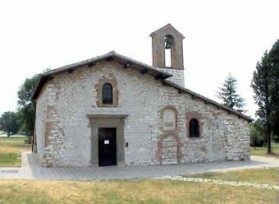 The construction of the Church of Santa Maria della Vittorina seems to date back to the 11th century in memory of a victory on the barbarians: from there the name "ad Victorias". Francesco, in 1213, obtains in guarantee from the Benedictines of S. Pietro, the small church of S. Maria of the Victory; the Franciscans will continue to live there up to 1240 after Christ, year in which they transfer to the new convent. The outside of the "Vittorina" does not have decorations that can be linked to the times of the construction, the walls are in local rock, they are supporting the double slope roof and are limiting the quadrangular environment of modest dimensions, from which emerges only the apse with rectangular plan. This last one, in the 15th century, is reduced by the construction of a wall for the placing of a crucifixion. Inside, the walls of the nave are decorated with frescoes of the 5th century, while the fourteen paintings reproducing the stories of the Madonna are dating back to the 7th century.